Democrat Jon Ossoff received more support than expected in his congressional run in a district that has been Republican-controlled for 37 years, but it was not enough to seal the deal. The 30 year old is now facing a runoff against Republican Karen Handel in the special election to fill the seat vacated by U.S. Secretary of Health and Human Services Tom Price. The New York Times called the election for Ossoff and Handel as the top two candidates netting the most votes shortly after midnight. Ossoff was the top vote-getter, garnering 48.3 percent of ballots cast as of press time. Since no candidate got 50 percent of the vote, Ossoff will face off against second-place finisher, Republican Karen Handel — who received 19.7 percent of the vote as of press time — in a runoff election June 20, according to the Times. The special election has drawn national attention, including that of U.S. President Donald J. Trump. “Just learned that Jon Ossoff, who is running for Congress in Georgia, doesn’t even live in the district. Republicans, get out and vote!” Trump tweeted April 18. Ossoff defended his decision to reside outside the district to The Atlanta-Journal Constitution, stating that he wanted to live within walking distance of the Emory School of Medicine where his girlfriend of 12 years, Alisha Kramer (18M), is enrolled. 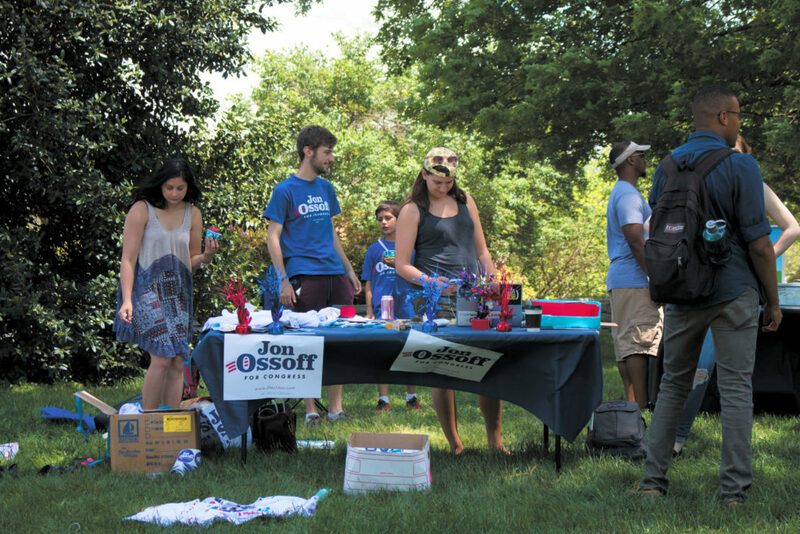 Student group Young Democrats of Emory and other Emory students rallied behind Ossoff, participating in canvasses and phone banks for the campaign, in an election that some say represents a test for the Democratic party’s effectiveness in resisting the policies of the Trump administration. Ossoff faced off against 11 Republican candidates, four other Democrats and two independents in the special election. His platform supports Planned Parenthood funding, affordable healthcare and education and criminal justice reform. The April 18 primary pitted all candidates against one another at the polls. The wunderkind campaigned with the slogans “Make Trump Furious” and “Flip the Sixth,” references the fact that the district has gradually begun to lean more Democratic. Former President Barack Obama beat Mitt Romney in the 2012 Presidential election in the district by 23 percent, while Trump only beat Hillary Clinton by 1 percent in the 2016 race. “We’ve definitely seen a groundswell of support among Emory students in reaction to the election results,” Emory Young Democrats Member and former Emory Students for Hillary Leader Felix Wu (19C) said. Young Democrats of Emory Freshman Liaison Brett Kleiman (20C) and Young Democrats of Emory President William Palmer (18C) first reached out to the Ossoff campaign via the campaign’s website in January, inquiring if the student group could help with campaign events. They were connected with the field office director, according to Kleiman. In the month preceding the election, Young Democrats members participated in five door-to-door canvassing sessions that attracted anywhere between five and 12 students, Kleiman said. Campaign team members visited campus April 16 to answer students’ questions about the candidate. Ossoff’s campaign also provided codes for free Lyft rides so that students at universities including Emory, Georgia Institute of Technology and University of Georgia could attend polling locations. Young Democrats member Nicholas Lal (17B) canvassed for Ossoff thrice, and cited Ossoff’s experience as CEO of Insight TWI, a film company that produces documentaries investigating corruption in government, as reason for his personal support. “Ossoff’s role in exposing fraud and corruption is going to make him a vital asset in Congressional Committees and he will bring integrity back to Congress, which it is currently lacking,” Lal said. Sixth congressional district resident Johnna Gadomski (20C) also canvassed with Young Democrats and hopes to continue advocating on behalf of the campaign with her family this summer leading up to the June 20 runoff election. Ossoff’s campaign has come to assume a larger symbolic meaning among Democrats and anti-Trump protesters, who view it as a way to transform their discontent with the Trump administration’s policies into action, according to The New York Times. Both Wu and Kleiman also noted that Ossoff’s relatively young age has attracted the support of a college demographic. “He doesn’t like to discuss his age but … as a millennial himself he really understands the issues that students are concerned with … like student loans or immigration reform,” Wu said. Ossoff raised $8.2 million dollars for his campaign in the three months leading up to the election, with more than 95 percent of that money coming from outside of the state. This is the 11th largest amount of money raised by a candidate running for the House in a single election cycle, according to OpenSecrets, a non-partisan, non-profit research group that tracks money in U.S. politics. The Georgia sixth congressional district contains the northern suburbs of Atlanta, including parts of Cobb, Fulton and DeKalb Counties, although it does not contain Emory’s Atlanta campus.